Currently on tour in support of, 'Neighborhoods' - their first album in nearly eight years, we couldn't be more proud to present our new interview with Blink-182's very own Mark Hoppus! Mark spoke to us about the new album, his fondest memories of Blink-182, today's pop-punk scene, Chelsea Football Club and more. Alter The Press: A lot of songs on 'Neighborhoods' reinvigorate the same energy found on earlier albums. Was this a conscious effort to appease fans? Mark Hoppus (bass): No, it wasn't an a conscious effort to appease fans, it was more of a conscious effort to appease ourselves because we didn't want to lay into a rut and make a really mellow record, especially after being gone for eight years. We wanted to come back with some fury and some fight, you know? ATP: Seeing as Jerry Finn was a big part in developing your past sound, how did you approach this album differently? Mark: I don't think we would have approached it any differently if Jerry had been there. Even though Jerry has passed on, he was definitely there with us in spirit. Over the course of recording with him, for a better part of a decade, he gave us so much knowledge; of what we were, and the tools that we needed, and the right way we needed to go about things. We felt like he was there as much as he was standing in the room. ATP: Did you consider bringing in a big name rock producer during the recording process? Mark: Absolutely, we thought about it a lot. I think we needed to see this record through on our own. There wasn’t the need for an independent third party between the three of us, it needed to be the battles of what happened in the studio, between the three of us, and not mediated by anybody. ATP: Looking back, are you glad you went ahead and self-produced the record? Mark: Yes I am. I think it was a learning process for us, and a struggle for us. I think it's a very great thing we needed, that we stuck to it and did it ourselves. ATP: You're currently trekking across the US on the Honda Civic Tour with My Chemical Romance and Matt and Kim (Manchester Orchestra on the first leg). Did you hand pick the line-up for this tour? Mark: Yes. We had been talking to My Chemical Romance for a while, initially they were a little reserved, they were interested, but they didn't know if they wanted to do it. Tom (DeLonge, guitar) actually went out to one of there shows, sat down with them and convinced them to do the tour. Matt and Kim was my suggestion, I really wanted to tour with them. Manchester Orchestra reached out to us, I had never actually met those dudes, but they ended up being one of the best bands I have ever met. This line-up has been awesome. We've had Rancid and H2O come out for some of these shows. It's been fun. ATP: Great choice for picking Matt and Kim, by the way! Mark: Matt and Kim are awesome. They put on the best show and I had no idea how they would pull it off, being just two members, and they are playing the most difficult slot as the opening band. They get up and kill it every night. ATP: Which songs do you enjoy playing the most from your back catalog? Mark: All of them, for different reasons. Because we've been a band for so long, we have such a large back catalog, so the songs we are playing are the ones that are our favorites to play live. I like playing songs like 'Violence', which was never a single it was kind of a deep album cut, but it's got so many different parts to it and so much energy; and a song like, 'Dumpweed', which is another album cut. Songs like 'Carousel', that we've been playing for 20 years, are still super fun to play. They are all favorites of ours. 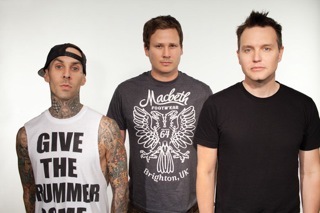 ATP: Which Blink-182 album has the most memories for you and why? Mark: Every album has memories, they are just different. With 'Enema Of The State', there was so much energy in the studio, as that was the first time our band was actually being listened to in anyway; we were on a major label and had the tools to make a really good record. On the last Blink record, it was super fun because we got to experiment and treat the studio like a musical laboratory. This record felt amazing because it was all new again and a fresh start. Now, I would say this record, but this record was a difficult one to make. It's rad to have a chance to come back and have people as interested as they are in our band. ATP: The album features a lot of synthesizers, you briefly flirted with them on your last album but what made you utilize them for 'Neighborhoods'? Mark: The synthesizers on this record are really Tom's influence; he was leading heavily on synthesizers, keyboards, pads, and those elements of songs. The creative struggle on this album was that I was trying to bring more rock guitar back into this record. I think that the end result was a good struggle between those two elements. ATP: Does broadening your sound with synthesizers mean that there will be more people joining you up on stage at some point? Mark: I don't know; we've talked about that before a few times because we do have keyboard and strange elements in the songs. I can see it and I cannot see it. When Nirvana brought in Pat Smear, as much as I love Smear, it seemed like, as an audience member, a little strange to have a fourth member of Nirvana on stage; and when Green Day started bringing in more members, with an additional guitarist and things like that, it was a little strange for me, as a fan, to watch other people on stage other than band members. ATP: Would you say 'Neighborhoods' is picking up where the self-titled record left off? Mark: I would indeed. I would say it continues on from where we stopped on the last record, as well as branching out to new areas and hopefully exploring new territories. ATP: Everyone knows that you're an avid Chelsea supporter (English soccer team) and, as a fan, out of the new Chelsea signings, who do you think will be most effective this season? Mark: I'm not familiar too much with the new signings this season; I've only seen who's out on the pitch. Are we three games in at the moment? But honestly, I'm still waiting for Torres (Chelsea striker) to kick in from last season, and step up and be the great hero that everyone thought he would be. ATP: What is your take on today's pop-punk scene? Mark: I feel like it needs a breath of fresh air. There are a few stand out bands who I think are doing good stuff, but I feel like there is a lot of noise but not a lot of good stuff rising to the top. There has to be something new to break. It's too formulaic. I think there are a lot of formulaic bands who aren't doing anything new and exciting. ATP: If you could back and change anything from your career in Blink-182, what would you have done differently and why? Mark: I don't know. I feel like the good and the bad decisions got us to where we are, and I love where we are. I wouldn't want to change anything. I probably would have invested more in Starbucks and Apple computers at the beginning of our career, I guess. ATP: You've stated at this point, you will not be touring at all from after the Honda Civic Tour up until the UK stretch next year. What do the three of you have planned up until then? Mark: We're trying to figure that out. It's a challenge for us right now because we want to play for all these different territories. We want to play for South America, Australia, Japan, Indonesia but obviously Travis (Barker, drums) doesn't want to fly right now, and we respect that, but we also want to do something for those markets so we're trying to figure out how that works. ATP: In closing, is there anything else you would like to add? Mark: Thank you to everyone in the UK who's continued to support our band through thick and thin. Hopefully this record is a great payoff for having to postpone the tour. We can't wait to be there next summer!